Bill O'Reilly is an American right wing political commentator and a news personality, with a daily show on Fox News. Bill is like the Arnab Goswami of USA or vice versa. Outspoken and sometimes even boorish Bill is loved and hated in equal measure by his audience, although watched by millions. Bill, along with Martin Dugard, is also the co-author of several popular historical books. Most notably their popular 'Killing' series. Killing Patton is their attempt at documenting the last few years of the audacious US general, George S Patton, who led the military campaign against the Nazi forces. The authors try and uncover the mystery behind Patton's strange and sudden death. It seems that the General was on the hit list of not only the Nazis, who regarded him as a superlative military commander but also Russians and some clandestine US Govt agencies. The reason why the latter wanted Patton dead was because by the end of the war Patton's status had grown legendary and he was planning to ascend to important political offices, but his view did not fit the new political views especially of some of his peers and these Govt agencies. There is some genuine evidence brought forward by Bill and Martin which indicates foul play in the car accident which lead to the death of Patton. I'm not sure what the governments response has been? This incident is reminiscent of the mysterious death of another military leader SC Bose, post the second world war. 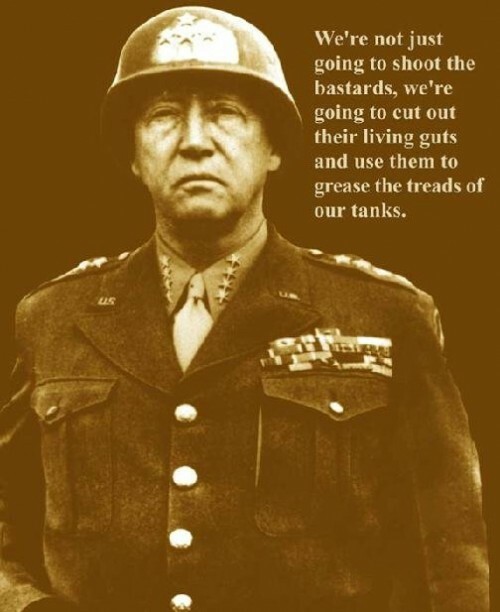 George S Patton has been quite accurately portrayed in the book. A war monger, audacious, brave, risky and the guy to get the job done. There are so many anecdotes about him in the book which are really fun to read, also gives an insight into his boorish and flamboyant personality. He was the stereotypical American, blue eyed, blonde, not too smart and always ready to fight. None of this takes anything away from his military achievements. The book traverses through parallel story lines, not just focusing on Patton and his story but the author takes us through different locations and personalities to give the reader a holistic view of the war and politics behind it. So we get to see what Hitler, Stalin, FDR and Churchill are up to at same time. Book is filled with war stories, battle tactics, pictures and gossip; Thoroughly entertaining. The book is quite well written and edited. The language in the book makes you feel that Bill O'Reilly wrote each and every word. When you read the book you can hear his voice narrating in your head. This is a must read for students of the second world war, Patton and history. Quite a colorful book, filled with pictures, maps and anecdotes. Enjoyed it! Will soon get my coveted hands on another one in the 'Killing' series.